And that’s even with Chinese exports down. Based on Chinese data analyzed by the BBC, exports from China dropped 4.4 percent in December, compared to the previous year, and imports also fell 7.6 percent. While a drop in exports and a drop in imports might sound good on the surface, from Washington’s perspective, it’s the reverse of the intended objective. What really happened is a 17.2-percent increase in the difference between what China exports to the U.S. and what it imports from the U.S. The gap is not in America’s favor—in fact, it’s going over $320 billion in the wrong direction. It was also largely unexpected as Reuters had forecast that exports from China would rise in December. So while this is bad news for China’s export sector, it’s a geopolitical win of sorts because it lends credence to the camp that views Trump’s tariff war with China as ineffective. If trade with China was unfair before, it’s even more so now. But there’s a flip side to this story, too. 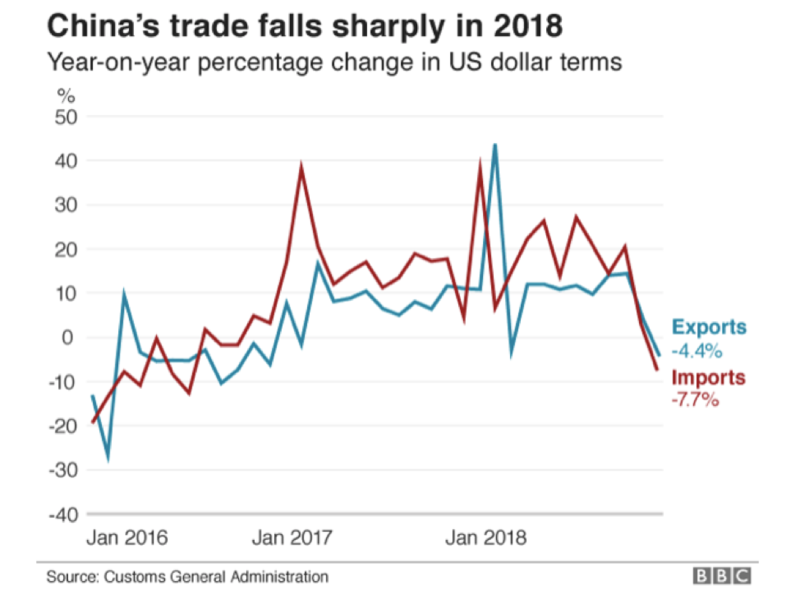 Even if the tariff war has had the reverse effect of making trade even less fair, it’s still not good news for China. What the data suggests is that Chinese consumers aren’t buying. They’re not buying in enough domestic goods, and their not buying enough imports. On Monday, Chinese e-commerce giant Alibaba (BABA) expressed concerns about an economic slowdown in China. “As a $13 trillion economy, it would be quite unusual if it could continue to grow at 7 percent or 8 percent,” the Wall Street Journal quoted BABA president Michael Evans as saying during a National Retail Federation annual conference. Evans said the slowdown was a result of both “natural causes” and trade tensions with the U.S.
Apple also sparked concerns of a Chinese slowdown earlier in January by blaming lackluster consumer buying in China for downsized Apple revenue guidance. Industrial production figures have also been disappointing for China, and the country has now seen its first reduction in car sales in nearly three decades. The popular benchmark for this is the Caixin Purchasing Managers’ Index (PMI), which saw its December reading dip below 50.0 for the first time since May 2017. Anything below 50.0 means contraction. Additionally, China’s National Bureau of Statistics on Monday recorded a contraction for December of 0.6, bringing it to 49.4. This was the first contraction the bureau has recorded since July 2016. In response to the data, China says it will pursue a package of tax cuts for small businesses to support the slowing economy. It’s also eyeing higher public spending. With trade talks that began last week, with a widening Chinese trade surplus with the U.S., and with the threat of a global economic slowdown that would produce zero winners.